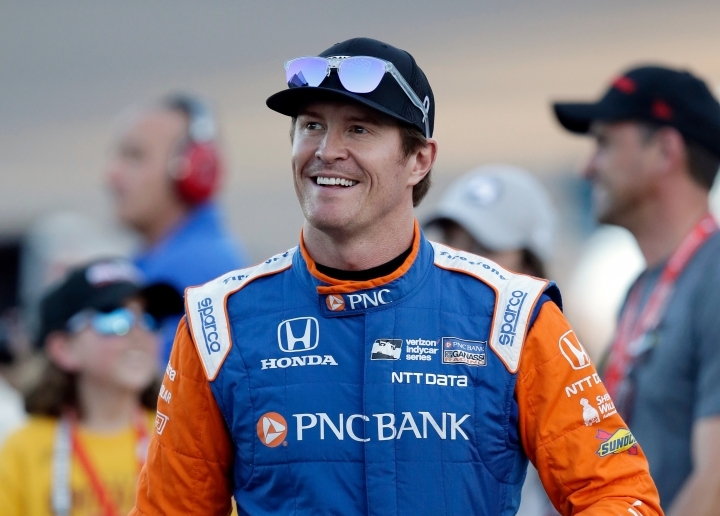 SONOMA, Calif. — Scott Dixon was fully reclined, quietly watching NASCAR on television with friends, as the clock inched toward the IndyCar season finale. A fifth championship was one steady Sunday drive away and Dixon wasn't the least bit stressed. 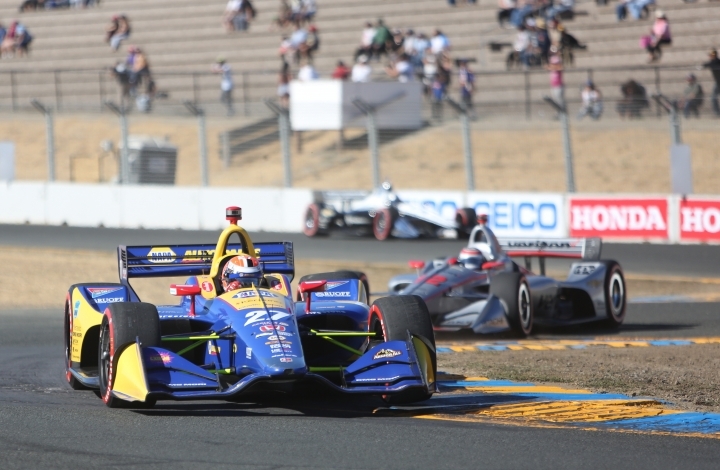 Dixon needed only an uneventful Sunday at Sonoma Raceway to win the championship and sealed it by finishing second, the same place he started, behind Ryan Hunter-Reay. The fifth title moved him into second in IndyCar history, two behind A.J. Foyt. "I can't believe this is actually happening," Dixon said. "You always doubt these situations and think they are never going to happen. It's all about the people and I'm the lucky one that gets to take it across the line." The 38-year-old New Zealander also won titles in 2003, 2008, 2013 and 2015, all with Chip Ganassi Racing. He's the longest tenured driver in Ganassi history and helped the team owner cap a strong organizational weekend in which Ross Chastain won NASCAR's Xfinity Series race, Kyle Larson finished second in NASCAR's opening playoff race and Dixon gave him a 12th IndyCar championship. "What an incredible ride it's been with this guy," said Ganassi, who celebrated the title the same way he did in 2015, by diving from the championship stage into the crowd assembled below. Dixon's task was eased when challenger Alexander Rossi hit teammate Marco Andretti seconds after the start and broke his front wing. Rossi had to pit for a new part, dropped to last in the field, and the championship was pretty much decided. Dixon held a 29-point lead over Rossi at the start of the day, and even though the race was worth double points, Rossi needed to be perfect to catch "The Iceman." Dixon's final points margin was 57 points over Rossi, who rallied to finish seventh. Rossi ended his third season in IndyCar second in the standings. "It was going to be a tough day to beat Scott anyway," Rossi said. "It's unfortunate to go out like that. I wish I could replay that a million more times. We have to look at 2018 and be pretty happy with it, even though we go away second and the first loser." As relaxed as Dixon appeared to be all day, he admitted after the race he didn't let up in the race car after Rossi's mishap. The title wasn't secure, he said, until he made it through the final round of pit stops cleanly. "You just never know, anything can happen," Dixon said. "We had a lot of grit. Rossi did a hell of a job, he's been pushing so hard this year and he's going to be a star." Hunter-Reay won for the 18th time and second this season. "To end this way is unreal," said Hunter-Reay, who dedicated the win to injured IndyCar driver Robert Wickens. "We wish he was here, he would have made my life a lot more difficult on the track today." Hunter-Reay also praised Dixon as the greatest driver of this IndyCar generation. "It's unthinkable what he's accomplished," Hunter-Reay said. "To share the track with him is awesome and to beat him is, too." Will Power and Simon Pagenaud finished third and fourth for Team Penske, which picked up its 500th organizational win earlier Sunday when Brad Keselowski won NASCAR's opening playoff race in Las Vegas. Roger Penske watched those closing laps from atop Power's timing stand as the end of NASCAR overlapped the start of IndyCar. Penske pumped his fist in the air several times after the Keselowski win. Power's finish gave the Indianapolis 500 winner third in the championship standings. KANAAN's 300th: Tony Kanaan is IndyCar's "Iron Man" and extended his streak Sunday with his 300th consecutive start. Kanaan made his debut at Homestead-Miami Speedway in March 1998, before current teammate Matheus Leist was even born. Kanaan finished 12th in the memorable start. SATO SIGNS: Takuma Sato has signed a contract extension to stay at Rahal Letterman Lanigan Racing next season. Sato won two weeks ago at Portland and team owner Bobby Rahal said the organization enjoys working with the driver. "He has always been very popular around the team whether he was driving for us or not," Rahal said. "The team has really gelled around him. His guys have done a great job as the season has progressed and of course Portland showed that." OLD NAMES: Colton Herta made his IndyCar debut with Harding Racing and gave the race a very throwback feel. Herta is the son of former IndyCar driver Bryan Herta and his debut marked the first time a Herta, Rahal, Andretti and Fittipaldi were on the same track since 1998. Those names dominated open wheel through the '90s with Michael Andretti, Bobby Rahal, Bryan Herta and Emerson Fittipaldi. On Sunday they were represented at Sonoma by sons Marco Andretti, Graham Rahal and Colton Herta, and Fittipaldi's grandson, Pietro Fittipaldi. Action Swift is your fighting sports news site featuring boxing, fencing, martial arts, mixed martial arts and sumo. It’s time for some action! Copyright © 2015 - 2019 Action Swift. All Rights Reserved.